Taylor Hunter led the Warriors with 36 points and 11 steals as the team pushed their winning streak to five straight with a 71-36 victory over Union College on Saturday night in Lincoln, Nebraska. Hunter hit seven three’s on the night which does put her in the record books for most three-point baskets in one game. “You will see Taylor break more records in the next few years,” Calvary Assistant Coach Kay Krahn said. 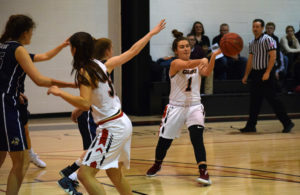 The Warriors came into the game on the heels of an emphatic NCCAA win over Champion Christian College on Tuesday in Hot Springs, Arkansas. Union College came into the game with a young team that is showing steady improvement under Coach Ron Dodds. Calvary stormed out of the gates with a 21-7 lead in the first quarter. The Warriors pushed the tempo with multiple fast-break layups to spark a 17-0 run in the second quarter as The Warriors extended the lead to 36-7. From there, Union could never could recover as the Warriors went on for a 71-36 win. Calvary got great production from Anna Davis with 15 points on the night and from Anna Holloway who added an additional 10 points and 9 assists. CU sees their next action Tuesday night in Joplin as they play Ozark Christian College.